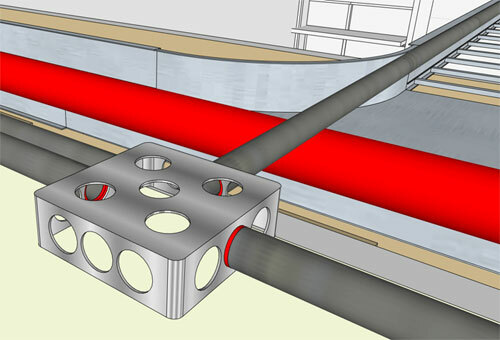 TIG has developed Dual Dims v1.1 for sketchup. This sketchup extension supports sketchup 2014 and higher version. The sketchup users can use this sketchup plugin to modify the dimensions inside Model into preferred ‘Dual’ format. It generally includes metric & imperial units. The sketchup users can access this plugin by visiting Menu and then Plugins and from there Extensions > TIG-DualDims. Application: Create a selection having Dimensions [disregard other objects]. If there exist NO Dimensions Selected then one has to opt for ALL in the existing context: Yes|No. Run the Tool from the Menu… In the dialog box, select the Setting as preferred. The default for the ‘Upper Units’ refer to the ‘Current Units’ – It will go with the existing Model Units settings for the number of d.p. and units suffix etc. While selecting any other units the ‘Upper d.p.’ already set up, is utilized,and also the selected ‘Upper Units’ suffix is attached to that text. Again if the ‘Lower Units’ not belong to the ‘Current Units’ [presumably], then the ‘Lower d.p.’ already set up will be applied, and the selected ‘Lower Units’ suffix is attached to that text. Units for both the Upper Units and the Lower Units text are chosen from the drop-down list – mm, cm, m, “, ‘ and ‘Current Units’. SketchUp Connector for Aras Innovator is an add-in for sketchup launched by AMC Bridge that makes the document management procedure simpler amid sketchup and Aras Innovator PLM System by integrating sketchup with Aras Innovator and offering direct access to PLM functionality from SketchUp. Register SketchUp document or document hierarchy into Aras® Innovator PLM system. Obtain Document from PLM system and open it within SketchUp. Accomplish lock/Unlock functions directly from SketchUp. Accumulate document modifications to Aras® Innovator. The users can access SketchUp connector for Aras® Innovator from SketchUp Extension Warehouse. Watch the following video presentation that highlights the functionalities of SketchUp connector for Aras® Innovator. Materialise has joined hands with Trimble to offer a new cloud-based service that will significantly progress the availableness and printability of 3D models currently belong to Trimble’s 3D Warehouse. Sketchup 2015 is the most updated version of Trimble and in this version the 3d warehouse has been expanded significantly. There are approximately 3 million downloadable 3D models which are downloaded by near about 1 million visitors per week over 4 million times. With this alliance, the printable aspect of 3D Warehouse will be supported by Materialise’s new cloud services to produce excellent STL files as well as adjust models if necessary. Trimble’s partnership with Materialise, will facilitate the 3d modelers and 3d artists to get rid of the general snags and inconveniences associated with 3D Printing workflows. The users will be capable of distributing and securely avail print-ready files directly inside 3D Warehouse. Materialise has been producing software for employing handy applications of 3D Printing, both medical and industrial to facilitate the users of 3D Printers to reap the huge advantages from their machines. By integrating new cloud service to 3D Warehouse, Materialise aims in providing a better user experience to the biggest 3D printing community. 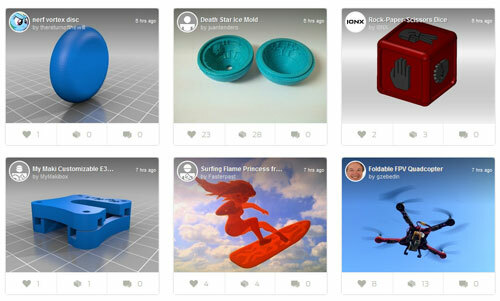 The Printables feature allows this community comprised of designers, artists, makers, and more, to concentrate more on the design and formation of consequential 3D Printing applications. Earthship Macedonia offers some easy-to-follow tricks for installing a model Phoenix Earthship.kmz inside sketchup. Learn the step-by-step processes by watching the following sketchup youtube video. Watch the following sketchup youtube video to discover some striking features of sketchup and PlusSpec which are very useful for the professionals dealing steel structure and electrical designs. They can easily produce virtual design of Steel end detailed electrical component in a BIM environment. PlusSpec is a useful plugin for Sketchup as well as a BIM/VDC software for effective building design, planning and estimating. It offers complete BIM solution for Architects by applying the power of Computer Aided Drafting (CAD). 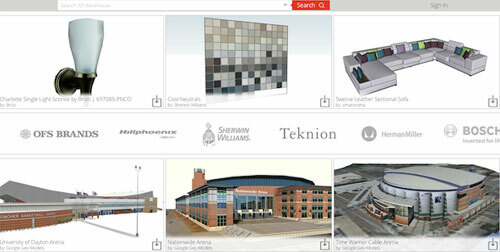 The newest acquirement consists of SketchUp in 2012 and Gehry Technologies in 2014, with various others making Trimble a world-wide player in the CAD marketplace. 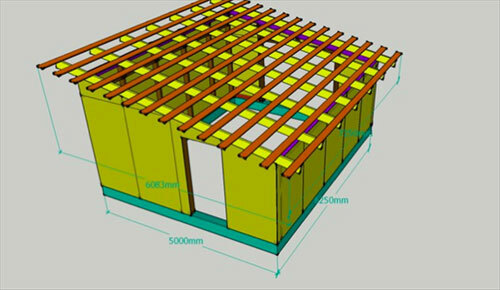 It has developed SketchUp and is creating it accessibility to different mobile field teams that need a simple, and low-cost, 3D CAD solution. MEPdesigner is actually a SketchUp plug-in prepared for the mechanical, electrical and piping disciplines. Shaun Bryant has written in his article that he had the chance to chat with Paul Goldsmith who is the segment manager and Douglas Elliott, the responsible product manager from Trimble about MEPdesigner (Version 1) that how the new plug-in works and what plans they have for it in the MEP marketplace. Primarily, Trimble was looking at SketchUp and resolute to pursue the 80/20 rule. As a guide, the top 20 percent of MEP users have Autodesk Revit MEP. Trimble required a product that permitted the other 80 percent to own a 3D MEP design tool. MEPdesigner fits perfectly into that other 80 percent segment, giving 3D design competence. In a go-getting six-month growth period, Trimble fashioned V1 of MEPdesigner, which is first and foremost created for electrical contractors and engineers who are by now, using Trimble’s SketchUp for theoretical engineering and design. Even if designers are not using SketchUp now, the interface is trouble-free to learn and use. Trimble’s MEPdesigner workflow permits for theoretical 3D design to be imported into Trimble Connect for online design development and clash spotting in existing 3D models. This permits design information to be taken care from the 3D model to the field. It also delivers a quick and efficient tools for SketchUp users for early theoretical MEP design, showing placement of equipment in a 3D environment, which permits for speedy clash detection and high-quality design intent communication with both the design team and team members onsite. When project management is to be concerned, the MEPdesigner allows the trouble-free communiqué of the 3D model among the owner, engineer and contractor and the field team and gives communication of design target of power, low voltage and specialist MEP systems. Collision detection is the name of the day which can lead to effectual pre-fabrication chances and improve the security record on the construction site. Another major advantage of MEPdesigner is the easiness in which daily work packages can be expressed to the suitable design teams. 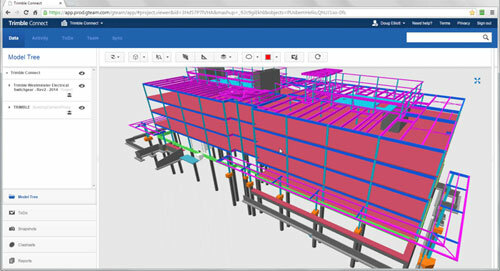 Using Trimble Connect via an internet browser, all 3D design can be highlighted and clash detect easily. As conversation with the Trimble team, SketchUp and MEPdesigner give the possibility to make all MEP team members 3D experts. MEPdesigner needs SketchUp Pro to function but this gives right of entry to the SketchUp 3D Warehouse and many manufacturers’ content also accessible in SketchUp, thus giving an unbelievable amount of content for any designer; beginner, intermediate or expert. MEPdesigner permits MEP design to go mobile. Bryant mentioned in his blog that interoperability with Trimble Connect. Any MEP design can be examined in the SketchUp Mobile Viewer, on tablets and other mobile gadgets. Field points can be added in MEPdesigner for the teams out in the field, which can then be utilized by the Trimble Field Points software with Robotic Station, giving accurate GPS point location for MEP data on any site. As designs are made in MEPdesigner, the Level of Detail (LoD) becomes very vital. Trimble is tergettign for LoD of 350 (LoD 350) with all visual representation of 3D designs. This is the required standard. The Trimble eco-system, MEPdesigner is spread via the Extension Warehouse, along with frequent Trimble AutoCAD apps, such as 2015Trimble Connect (acquired from Gehry Technologies). Bryant was very happy with the section tool in Trimble Connect as he wrote in his blog. In a 3D view, this allowable for what has to be some of the easiest section manipulation he had seen in a 3D model. It is slick, fast and works. The Version 1 of MEPdesigner is meant for electrical designers and contractors, with the bulk of 3D parts coming from another Trimble spin-off, TradeService. This controls all 3D data in MEPdesigner. While these parts are mainly electrical, there will be much more targeting on piping and ducting in later versions with the 3D Warehouse provided that the mainstream of 3D components in SketchUp itself. One of SketchUp’s main triumphant is the ability to convert 2D drawings to 3D models. In a step-by-step process, SketchUp and MEPdesigner can get better a 3D MEP model rapidly and successfully. Step 1: Using Trimble Connect, a 2D reference model can be carried to SketchUp. 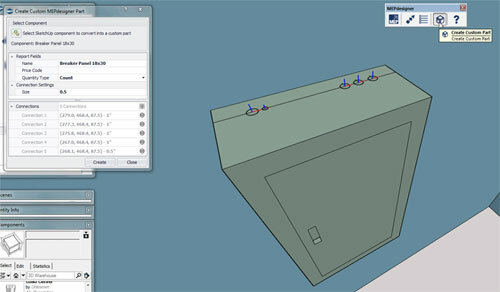 A 3D model can then be generated from the 2D reference drawing, using 3D components in SketchUp. Typical component would be walls, doors and windows. Service openings can then be generated as well. As Trimble Connect is a free SketchUp Extension, the reference model link is faultless. Step 2: Using MEPdesigner, the 3D model would be populated with 3D MEP components, which would then be linked with MEPdesigner by way of electrical conduit, as V1 of MEPdesigner is mainly electrical. There is no aptitude to bend conduit or use flex conduit in V1 as its main content revolves around larger rigid electrical components. However, custom components can be developed from the basic components that given, such as a breaker panel with specific connections. MEPdesigner is diverse to most SketchUp plug-ins by way of its top level menu and toolbar that users usually use to carry on the design palette and tools. This interface is used to add parts and route conduit. Once these parts are in place, part grip can be facilitated in SketchUp in the common way and conduit and cable trays come in with real world lengths with spacers and couplings. Once created, all MEPdesigner models can be loaded into Tekla BIMsight, where smash detections can tag and allocated to field teams. This tagged impact can then be brought back into MEPdesigner, reviewed, re-designed therefore and then signed off by the field teams. Using SketchUp Layout, views from the 3D model can be sent to paper or electronic drawings. Any points can then be sent to field teams using the Trimble Robotic Station. 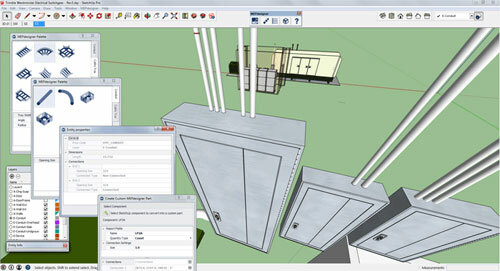 Conclusion: SketchUp Pro with the MEPdesigner plug-in gives an immense 3D MEP solution for within $1,000. However, it does have a long way to go to fight with some of its other contestants in this trade, such as Autodesk Revit MEP with its flexible conduit and layout testing tools. But bearing in mind that MEPdesigner is only at Version 1, as per his blog, Bryant was sure about the growth team at Trimble will be working in the best way to make improvements and to prepare much more content. V1 of MEPdesigner is targeted at the electrical marketplace setting up bigger electrical installations. With piping and ducting to follow, the MEPdesigner SketchUp plug-in will go from force to force, competing well with other MEP application offerings. SketchUp has enhanced noticeably since the getting hold of ownership by Trimble, and MEPdesigner will be treated with the same rigid development and marketing, thus positioning it in the marketplace as the inexpensive easy learning solution, which is precisely where Trimble wants to be. Overall, the MEPdesigner being a highly functional plug-in for SketchUp with a good future ahead of it, as long as Trimble keeps up the product development and component development it has fixed to SketchUp so far. Muhammed Anas Mullick presents a useful video for sketchup users that shows how to create speed drawing for a MAM architecture with the Majistic View. There are also other parts of this MAM architecture video. The sketchup users can apply a new scattering extension for Sketchup alias Skatter to produce vegetation inside sketchup. This sketchup extension is still in beta stage and will be available soon for commercial usage. Skatter is compatible with V-ray, Thea and Kerkythea. In future, it can support Octane, Indigo and Maxwell Render. Go through the following video that demonstrates the alpha view of this sketchup plugin. This video will show the users how the plugin performs with rendering engines as well as creates component instances within sketchup. MakerBot introduced a new iPad app alias Shape Maker tool that is an upgraded part of the MakerBot’s free PrintShop App. By applying this newest 3d modeling app, the users will be able to transform their drawings, photos, sketches as well as screen captures into the 3d printable files. With the in-built camera of the app, the users can snap a photograph from any drawing or sketch (the drawing or sketch must be bold with higher resolution). As soon as the photograph is taken, the users can use the option to extrude the shape according to their preferred depth. This new 3d design tool will facilitate the users to produce 3d designs out of any 2d drawing easily and make them 3d printable. This 3d printing app will be a great resource for classrooms which apply a 3D printer as part of their STEM curriculum. The new Shape Maker Tool is accessible in iTunes for download on iPad. Watch the following online demo of this newly launched 3d design tool.